This holiday season, we are excited to offer a new way for you to encourage your friends, family and co-workers to try out acupuncture and experience its benefits: FREE holiday vouchers for initial acupuncture visit at Sarana! These are great to hand out at holiday gatherings or to use as small gifts /stocking stuffers. The vouchers are good through January 31st, 2019 only. Feel free to download, print, or email them to anyone you like. The link above leads to a page with 4 vouchers that you can cut into quarters (they print out fine in black and white or in color). We will have some printed copies available at the clinic as well. Wishing everyone a healthy and relaxing holidays! 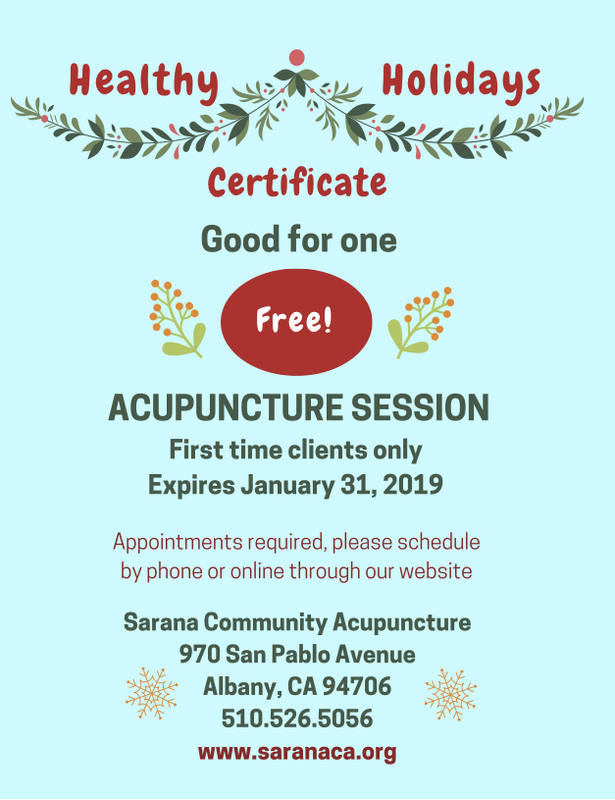 This entry was posted in Clinic Updates, Community Outreach, Discounts, Specials & Events and tagged affodable acupuncture, free acupuncture, healing by Sarana Community Acupuncture. Bookmark the permalink.